This is a review of the product HairAnew by Naturenetics. The manufacturer claims that this product has an exceptional blend of eleven unique ingredients including vitamins as well as biotin that can effectively address vitamin deficiency causing the lack of hair growth as well as hair loss. Read on to learn more about its ingredients as well as our opinion of whether it is the right product to take for the growth and health of your hair. The side effects of this product are rare and minimal. Therefore this product is considered safe for long term use. However, you may experience an upset stomach if you don’t take this capsule with a meal. In case of an allergic reaction to any of the ingredient in the product, you should contact a doctor immediately. The list price of the product is $59.99 on the company’s website but it is now available at a price of $29.71 on the Amazon website and includes sixty capsules – enough to last a full month. The manufacturer of this product offers a hundred percent money back guarantee and states that if you are not satisfied with the product and if it doesn’t display the desired results then you will be provided a full refund without any hassle or questions. The manufacturer has specified that you have up to hundred days to return it after purchase. The reviews of this product are also positive. Naturenetics HairAnew is a vegetarian product that is claimed to be free of gluten as well as eggs, fish, peanuts, wheat, soybeans, tree nuts and shellfish. In addition to this, the manufacturer also claims that it doesn’t contain any kind of artificial preservatives, colors, sweeteners or flavors. The product is not only affordable but is also suitable for vegans and vegetarians. It is also recommended by various hair dressers because not only does it contain 5000 mcg of biotin but it is also composed of ten other unique vitamins and minerals that can impact the deficiency in our body causing hair loss and also improve the health of our hair. Additionally, the manufacturer claims that it can also improve our skin and nails. However this product is only meant to address the deficiencies in our body and is not intended to be used in any way to diagnose, cure or treat an illness or disease. 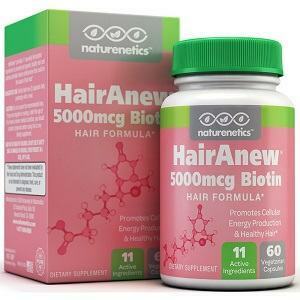 John Brownstone	reviewed Naturenetics HairAnew	on July 16th	 and gave it a rating of 4.